It’s difficult to know what you will really need when decorating a nursery for the first time. One piece of furniture that will make your lives as new parents easier is a rocking armchair. As you rock back and forth you will feel the tension disappear from you and the baby. 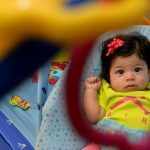 As nursing moms know, a comfortable rocking chair is essential for feeding, and babies soon go to sleep with a rocking motion. As the child grows, these traditional chairs remain useful when little ones feel unwell or restless. The chair can always be moved into another room if space becomes tight as these seats look fabulous in any room. It’s a purchase you’ll be glad you made. The Dutailier Sleigh Glider-Multi-Position Recline and Nursing Ottoman Combo comes with plenty of very useful features. A separate, rocking footstool enables you to keep your feet up as you glide back and forth in the chair. Thick cushions on the chair seat and a sturdy wood frame make this a comfy piece of furniture that will last for years. 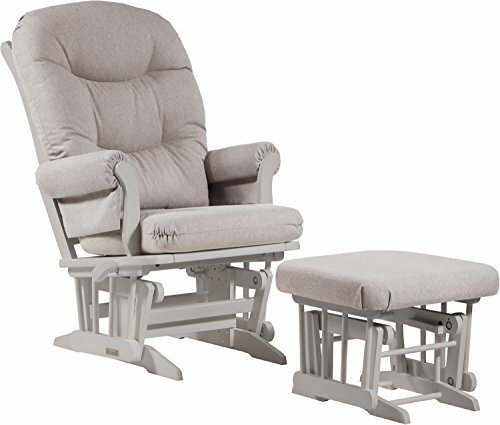 The most unique feature of this chair is its 6 position reclining action – you can select your favorite angle which is great for nursing a newborn or having a nap. Being able to lock the chair into a recline position an outstanding feature that is important for nighttime. The cushions on this chair can be removed, but the covers do not come off for cleaning – the fabric sponges clean easily. The nursing chair needs to be self-assembled at home, but one person can put it together quickly. 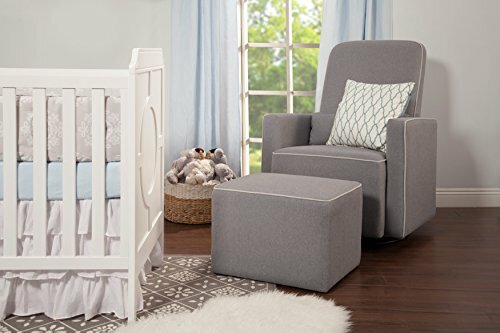 The budget-friendly Storkcraft Custom Hoop Glider and Ottoman is an attractive addition to a nursery or bedroom. Made with a strong wooden frame, the enclosed ball bearings give this chair a smooth gliding motion. A coordinating foot stool gently rocks so that you can glide backwards and forwards with your feet up. This Storkcraft chair has padded arms and a handy side pocket that is perfect for holding little things like your phone, a book or the remote control. This chair has an affordable price tag but some taller or larger people may find it a little too small for comfort. It requires some assembly at home but is simple enough for one person to do by themselves. 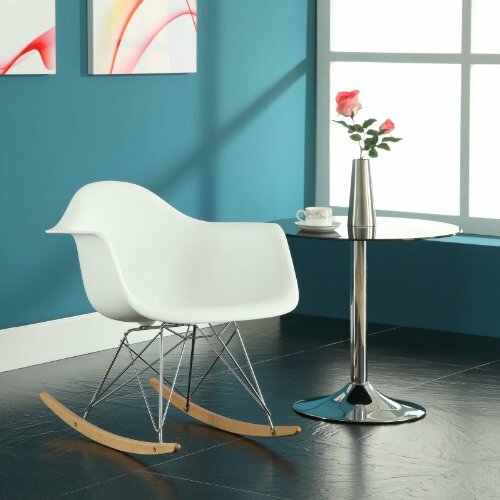 For a modern home, the Modway Rocker Molded Plastic rocking chair is a perfect choice. It’s an affordable version of the Charles and Ray Eames mid century chair and it features distinctive wire, ‘Eiffel’ legs and a simple molded seat. This chair adds contemporary style to the living room, bedroom and even the kitchen. 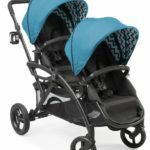 The gentle rocking motion will soothe baby and relax parents after a long day. Thanks to the wipe clean plastic, it is also very functional. Its lightweight construction means chair moving is easy so you can take it outside, upstairs or next door easily. With a choice of shades, the Modway Rocker fits in well with any color scheme. This chair is a little smaller than traditional rocking chairs so will take up less room. The back is lower and the sitting position is upright, so it is not a chair to snooze in. 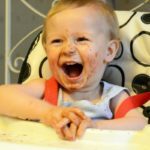 It is a versatile chair that can be used in so many ways when the little ones have grown. The DaVinci Olive Upholstered Swivel Glider with Bonus Ottoman swivels around on a metal base, and it also glides back and forth in a relaxing motion. The coordinating ottoman is static for a non-rocking footrest and it can also be used as extra seating or a side table. 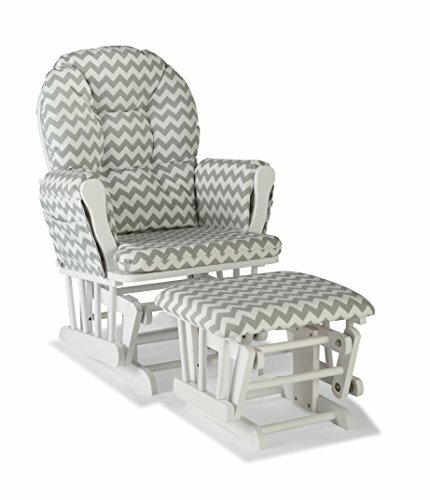 This glider is comfortable for nursing mothers and parents of all ages. Covered in soft polyester upholstery fabric, this chair offers a simple, elegant style. The chair has plenty of seating room and has a high back plus a lower-lumbar pillow. Manufactured to be free of formaldehyde and chemical flame retardants. The comfort of the extra padded seat and back is what sets this rocker chair apart from the others. It comes assembled so it is ready to use straight away, but there must be sufficient room to get the complete chair through entrance ways. 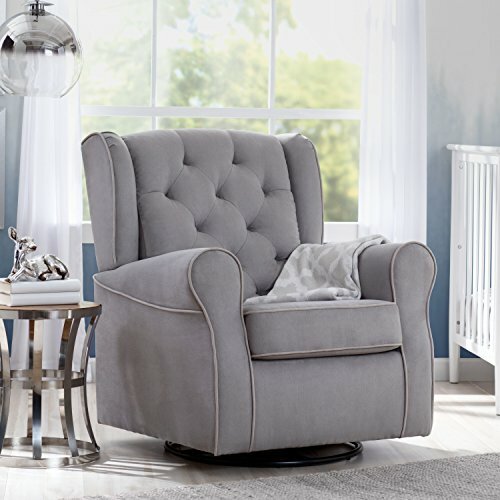 The deep cushioning on the Delta Children Emerson Upholstered Glider Swivel Rocker Chair makes it very comfortable. 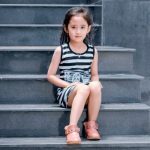 It is a versatile chair that can be used for nursing, rocking a child to sleep or as a living room seat for everyday use. The upholstery is high quality and sponges clean, it is also lovely to the touch. The wooden frame is sturdy, and the motion is a swivel action plus a gliding action. Wide armrests and a deep buttoned back give this chair a sumptuous appearance that will last the test of time. It is delivered in two parts so requires self assembly which some people have found tricky. With a variety of styles and features available, take some time choosing the right type of chair for you. The look of the furniture is important, but so is the support and comfort it offers. Measure the space you have available to make sure it will fit easily into your room. This chair will be part of your home for many years, so select one that will be easy to keep clean and looking fresh. 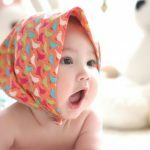 Make sure the one you buy is made using non-toxic materials and avoid any using flame retardant chemicals to make sure your precious baby is safe.